CHS Seniors Baylee Eigenheer and Shawn Koscheski share a "selfie" photo with School Superintendent Lance West Thursday. Mr. West was the speaker for the Chamber monthly meeting and the students were quests of the Chamber. Baylee and Shawn are also the 2014 CHS Homecoming Queen & King. Collinsville School Superintendent Lance West presented a positive view of all things happening at Collinsville public schools. 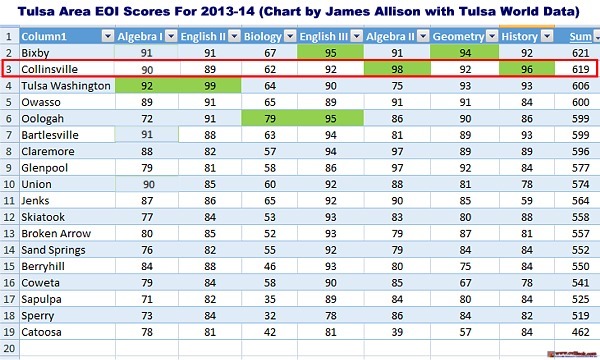 Although there are challenges as a result years of funding cutbacks and most recently teacher shortages, good things continue to happen. * As of Oct. 1st the official student count was 2694 Collinsville public school students (746 at the high school). Following the Chamber meeting Thursday Oct. 2nd, there was a ribbon cutting at Callie's Cache at 1014 W. Main. Lora Thompson (holding the scissors) and her sister LuVona Copeland (not present) will be having their grand opening this Saturday. Their phone number is 918-371-3130. On Main Street look for the bright yellow awning across the street from the Crown Theatre. 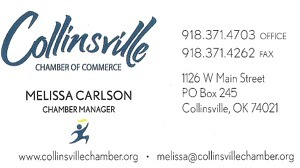 Melissa Carlson is the Collinsville Chamber of Commerce's new manager. She will be sharing the office at 1126 W. Main with the former chamber manager (Shelley Nachtigall) who is now managing Collinsville Downtown Inc.